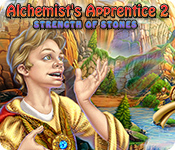 Alchemist's Apprentice 2: Strength of Stones is rated 3.9 out of 5 by 15. 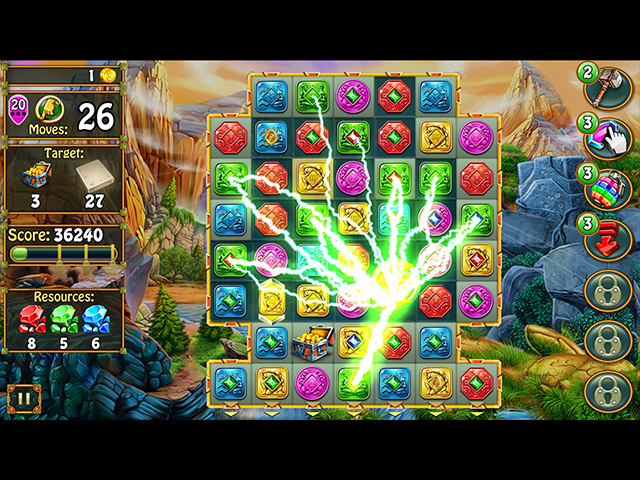 Rated 5 out of 5 by TheRealMagicJack from A Fun New Match-3 Game For the price, you can't beat this new match-3 game. It's a lot of game for the money. The objects are big, the graphics and sounds are perfect, and the difficulty can be adjusted from invincible to challenging with a wonderful variety of moves and combinations. The game is smooth running & action-filled with very active and large visuals. It's easy on the eyes as well with the large themed graphics. I love it, big thumbs up! It has a slight retro-feel to it with the action and sound but with modern graphics. Rated 5 out of 5 by a7752p from Alchemist's Apprentice Great game! Not a game for children, but great for adults that want a challenge.Played through the whole game,took a few days to get through it using the timer option. Definitely not a boring game! Rated 5 out of 5 by A_Holovacs from Wow! A match 3 worthy of 5 stars This game has more depth than the average match 3. On the surface it appears quite ordinary and boring, If you read the directions you'll find that different combinations of power-ups cause unique effects that will help you achieve 3 stars. 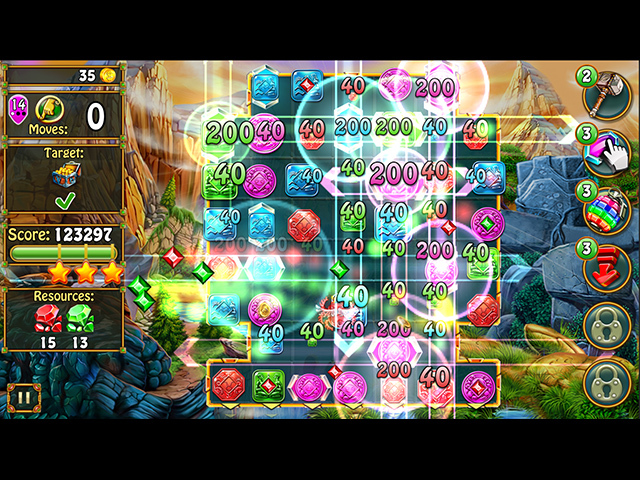 The game allows you to replay earlier levels with your new powers, and has timed, moves, and relaxed modes. 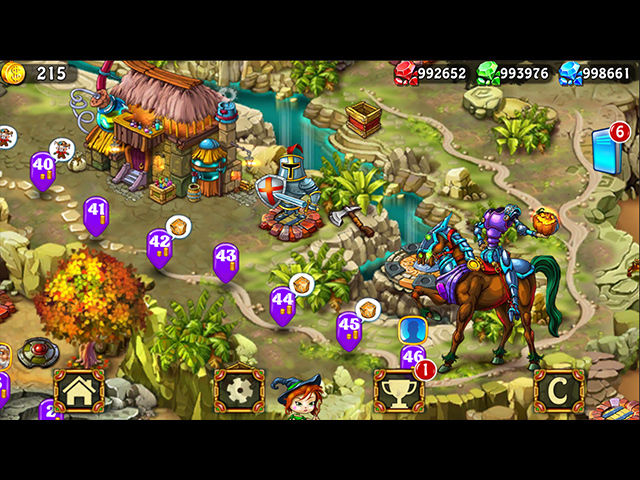 The graphics are great, it has a real story line, and you can click at top speed with no problems. A great and more challenging match 3. Rated 5 out of 5 by renatetoo from Great Match 3 I like match 3 games a lot. Everyone has different things that they like or look for in a game. For me, I want the option of no timer and no limited moves. I want to enjoy myself -- not be harassed. I also want to be able to make moves immediately, especially while things are automatically falling. I like different challenges (drop something, collect a certain number, etc). This game has everything I like in it. I would purchase it if it weren't for the subject matter. If I have to interact with witches, demons, gods, etc, then the game is not for me. A similar game that involves science fiction, steampunk, non-occult storytelling, and the like are most welcome. Rated 5 out of 5 by csivell from Another great from the "Quick Click" Team !!! As far as I'm concerned these guys never fail to deliver !! Play at any level and It's my guess you'll enjoy it !! Rated 4 out of 5 by Snowdragon_23 from Fun game A cute fun little M3 game and buy for me. Sort of like a scaled-down version of Gummy Drop. Rated 4 out of 5 by cyndrap from A lot to this game At first this seemed very simplistic but the more I played the more involved it became Played through the first 10 levels then started over to use the various power ups and strategies learned. A lot of fun. Much more involved game than it first appears. Good colors, the character drawings are odd but not a real issue I bought it - I like this game. Rated 4 out of 5 by bep1 from I like it. I find this game to be enjoyable, but then I play on the relaxed mode, don't need the tension of trying to do it the hard way. I like the powerups and how the game plays. Found it to be interesting and fun and worth the $3.49 they are charging today, so I bought it.